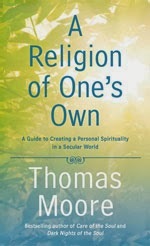 Moore "suggests things to do that will enable us to fashion our own religion, like studying the great religions of the world, reading poetry like the works of Emily Dickinson and Jane Hirschfield (two of my favorites), making art, observing art, reading Thoreau and Emerson and of course, spending time in Nature. When he signed my book I told him how I had been creating my own religion for 40 years and just didn't know it. I told him how I had incorporated so much of what he had talked about ― art, poetry, literature and that now I realized I could put it all into a personal context. He looked me straight in the eyes and said "Do it!" There was a real connection there which I will always cherish. And I am going to "do it!"